AOMA graduates have become private practice acupuncturists, herbalists, entrepreneurs, authors, and even university faculty. They speak at national conferences, publish books and journal articles about Chinese medicine, and teach at the graduate level. In sum, AOMA graduates have discovered a life of passion and purpose – a life where personal fulfillment meets professional achievement. Career services include resources for acupuncture job opportunities, mentoring, career counseling, resume support and more! If you would like to be a part of the referral network, please complete the below questionnaire. This is a great opportunity for everyone to share opportunities with one another. If you are a part of the Facebook group, simply tag Qi Bo when someone is looking for an acupuncturist in ____ city OR email CareerServices@aoma.edu. We will get a response back within one business day with a list of all of the practitioners in that area, including name of the practice, practitioner, address, website, preferred email, and preferred phone number, as provided by the practitioner. AOMA posts job and office space opportunities around the country on our job board. All alumni will continue to receive discounts at AOMA Herbal Medicine. AOMA is committed to life-long learning and, to that end, alumni may audit program courses. Program courses are those courses outlined in the AOMA school catalog. AOMA graduates receive one audit of a program course free per year. Additional audits of program courses cost alumni $25/credit. View course schedules. AOMA provides the Austin area with a wide variety of speakers and opportunities for continued learning and scholarly engagement with the community. AAA members are eligible for special rates on AOMA-sponsored special seminars (non-continuing education), informal classes, and continuing education courses offered through AOMA, in addition to the annual Southwest Symposium. AOMA campus library access and borrowing privileges. Custom AOMA diploma frames are available for purchase from the Church Hill Classics website. 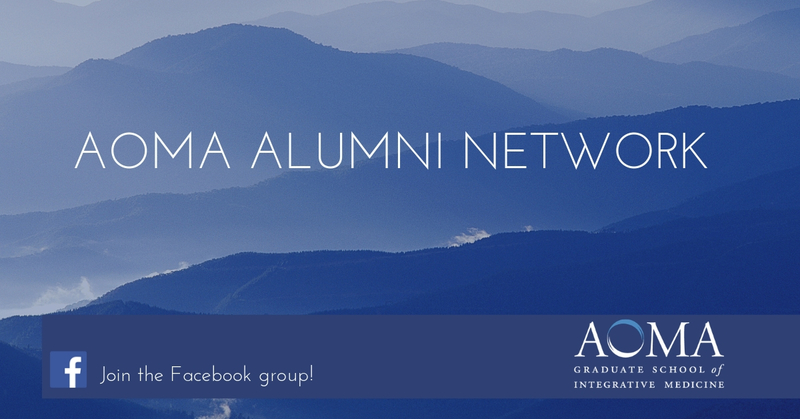 Join the AOMA Alumni Facebook Group! The Student and Career Services Department is available for consultation and other sources of support including career counseling and resume support. Please email or call (512) 492-3024 (toll free (800) 824-9987, ext. 224) to contact us.